Substrates with ColorPRO Technology perform to a strict set of specifications to meet industry-leading performance standards. The specific technology behind media with ColorPRO Technology varies from product to product; however, all products with ColorPRO Technology utilize advanced technologies which have been designed together with Original HP inks and HP printers and presses to optimize printing system performance. The Printing Applications Laboratory at RIT performs ColorPRO Technology Qualification on submitted media. 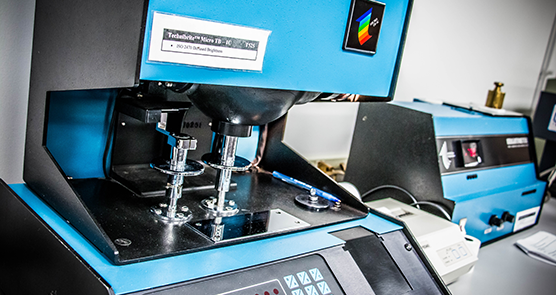 As an independent third-party testing facility, PAL has been exclusively chosen to ensure and validate compliance with ColorPRO Technology specifications. PAL has the technology, management, and the established infrastructure required for worldwide-class testing programs required by the ColorPRO Technology Initiative, as well as broad experience in handling long-term global testing and qualification programs. Paper Company provides Qualification Paper Sample to PAL from every sample to be qualified. Strips will be z-folded every 10-12 inches. Refer to the license agreement for additional sampling details and product definitions. Material originating from outside the U.S. must include an original commercial invoice, and/or a bill of lading. This will assist with clearing the material through customs and reduce shipping delays. PAL will confirm receipt of paper and testing schedule upon receipt of required paper and completed ColorPRO Technology Paper Qualification Testing Program Request form. PAL will perform the tests required to assess if the paper meets the specifications set by the program. Upon completion of testing, PAL will provide a summary report back to the Paper Company indicating pass/fail result. What are the tests in ColorPRO Technology qualification? How long does it take to test the samples? Approximately 2 weeks after paper samples are received are required to provide results. PAL will confirm the testing schedule with each Paper Company upon receipt of the paper required for testing. Who developed these tests and the passing specifications? HP developed these tests with the support and input from major paper companies. If a paper passes all tests, does a paper company automatically get the right to use the ColorPRO Technology logo? No, passing PAL testing does not mean the Paper Company can automatically obtain the rights to use the ColorPRO logo. For details on the ColorPRO Partnership Program, contact the ColorPRO Partnership Program Manager (colorprotechnology@hp.com). Does PAL make the final determination as to who passes or fail the qualification tests? Yes, PAL will make the final determination on whether the particular sample passes or fails the qualification. All tests must get a pass from PAL before proceeding further. If a Qualification Paper Sample fails the tests, there is a specific set of requirements for sample resubmission. Representation of the sample sent for qualification over multiple brands/weights/finishes of the paper products, as well as other aspects of the production, will be specified further in the final supplied report . For more details, please contact PAL. Would my samples and testing results be kept confidential by PAL? Yes, PAL will not share your name or testing results with anyone unless the Paper Company authorizes PAL to do so; however, PAL will notify the Licensor if the paper passes or fails the tests as this is one of the requirements to get the rights to use the ColorPRO logo. Do other companies or organizations subsidize the qualification testing fees or costs?